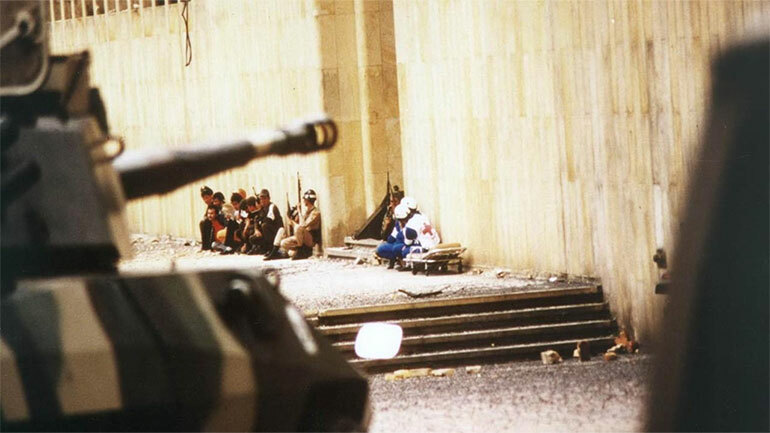 The Palace of Justice siege refers to the 1985 occupation of Colombia’s Supreme Court building by M-19 guerrillas, and the subsequent violent military retake that cost the lives of at least a 100 people, including half the court. On November 6, 1985, at least 30 guerrillas from the rebel group Movement M-19 stormed the Palace of justice and took 300 hostages with the attention putting then-President Belasario Betancur and his Defense Minister on trial for violating a peace agreement. The government responded with a heavy assault on the palace which left at least 100 people dead, 11 of whom were Supreme Court magistrates. According to Irish-Colombian journalist Ana Carrigan, Chief Justice Alfonso Reyes tried to contact President Betancur to arrange for ceasefire and negotiations. Betancur, however, refused to take phone calls from the magistrate and handed over the affair to the military. Reyes was among those killed in the siege. In addition to the known fatalities, there are at least 11 people who disappeared after the siege, mostly cafeteria workers. One was subsequently found in a mass grave. It is widely believed that several people suspected of ties to Movement M-19 were taken alive from the palace, tortured, and killed by the military. In 2010, an army colonel was convicted of having participated in these disappearances and given 30 years in prison. Three other army officers face similar charges. There have been accusations that the M-19 assault was done with the support of Pablo Escobar and the Medellin Cartel. According to his former hitman, Escobar provided $2 million to the group to aid the operation. Other Colombian officials also accused M-19 of these ties, though the 1986 Special Commission of Inquiry established by President Betancur was unable to substantiate the claims. The supposed reason for the connection was the confluence of interest between M-19 and the drug lords against an extradition treaty with the United States, which the guerrilla group opposed on nationalist grounds. The court was reportedly scheduled to deliberate on the constitutionality of the law the day the palace was taken over.